The first Mozambican music I heard was by Eyuphuro ( Mama Mosambiki, Real World CDRW10) a guitar band whose sound had much in common with other modern African music, but also had a clearly audible legacy from the Portuguese colonial past, particularly in the vocals, which had that haunting, unmistakable - and untranslatable - quality of saudade: nostalgia, irony, regret - sadness with a smile, perhaps. Orchestra Marrabenta fuse European harmonies with local melodies and rhythms in the usual fashion of modern African bands, but there seems, to my ear, to be less of the specifically Portuguese input in their music, save on the unexpected and lovely ballad A Va Saty Va Lomo, delivered by female singer Mingas. This soulful, yearning number also supplies a reminder of the gulf that language sets up between musicians and listeners from elsewhere; the translation given in the booklet reads, in its entirety, "When I think about lazy people, it reminds me of Cicilia." Marrabenta is described as "the urban music of Maputo", and as favouring "songs with topical subject matter," so possibly there is a social message of some kind involved, but for the outsider, A Va Saty Va Lomo, with its gloriously sleazy sax obbligato, stands as - but given the language barrier, as no more than - a fine example of music that suits when the lights are low and the hands are wandering. Mostly, Orchestra Marrabenta's music is bright, lively and uptempo, with lyrics that celebrate life's pleasures in a country that has had more than its share of life's horrors; the lineup is two lead guitars, bass, drums, percussion, occasional keyboards, two trumpets and saxophone. Most of the lead vocals are handled by male singer Wazimbo, who has that high, caressing, immensely sensual sound which, in part at least, descends from the immense popularity of the French singer Tino Rossi during the Belgian colonial era. The guitar players are clearly influenced by the sounds emanating from Zaire, but they also seem to owe a good deal to the traditional timbila (xylophone) orchestras; the resultant sound is more chiming, less percussive, than the guitars of soukous, and is both distinctive and very attractive. The guitars' overlapping lines may also owe something to the hocketing used both by traditional Mozambican pan pipe orchestras and in the vocal style that can be heard on the CD named after it, Saba Saba! (Globestyle CDORBD 077). The drum figures that punctuate the music sometimes have a thunderous volume, no doubt as a result of the seductive possibilities of amplification, but they also appear to be echoes of the traditional past; figures very like them are to be heard from the drum orchestras on Globestyle's two Mozambican anthologies ( Mozambique 1 and 2, CDORBD 086 and 087). I ought to say, too, that the drums' thunderous volume is not inappropriate or excessive in the context of the band's sound. 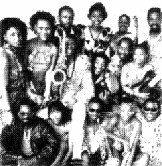 The totality is a delightful dance music, made the more so by the call-and-response between guitars and/or vocalists and the brass section, who seem to have been listening pretty intensively to salsa and other Hispanic-American sounds, rather than those of Brazil, which might seem more a likely influence; but the development of modern Zairean music began with the return home of Afro-Cuban music, and if I keep returning to the Zairean influence, it's because Africa's musicians have also done so for the last forty or more years. This, and my other comments on the band's possible influences, are all fairly speculative; it's difficult for a non-expert to be definitive, and the superficial annotation supplied with the CD does not help. One track, Nwahulwana, is subtitled (electric version), and one assumes that this is a traditional song given a modern treatment, but the notes are silent on the point. Whether or not marrabenta is "earthier than Zairean soukous and subtler than South African jive," as claimed on the back cover, is a fairly pointless debate, and of little use in analysing the music; ultimately, it means no more than "please buy this record." I'll go along with that; one incontestable statement in the notes is that marrabenta is "thrilling and uplifting." Certainly this is better than the description quoted from "The Rough Guide to World Music": "an outfit of enormous guts and sparkle," which calls to mind a seventies glamrock band, now middle aged, but still wearily schlepping its amplifiers around the working men's clubs of the North of England.